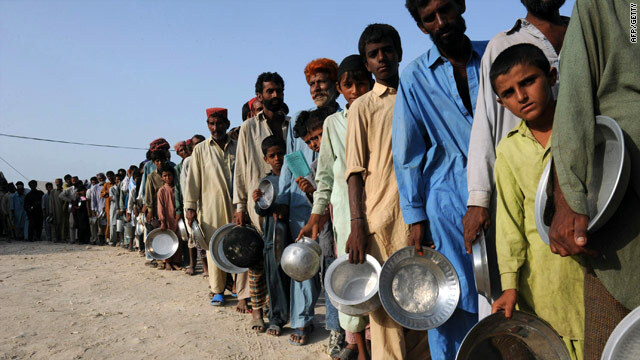 Flood victims wait for food and water at a makeshift camp in Sukkur on August 23, 2010. (CNN) -- The statistics are devastating, but for aid workers like Faisal Kapadia and Awab Alvi, witnessing the despair from the Pakistan flooding was far more tragic than they imagined. "You can see 8,000 to 10,000 people in Sukkur in the road, sleeping in the mud," said Kapadia, a resident of Karachi. "All the people are sitting on the side of road, defecating there, drinking water there, living there." Roughly 4 million people are homeless from mammoth flooding that covered much of Pakistan for three weeks. Hundreds of health facilities are damaged or destroyed. Millions are at risk for deadly waterborne diseases from the filthy flood waters. Officials estimate the death toll between 1,500 and 1,600, but Kapadia says he thinks the numbers could skyrocket as water recedes and more bodies and animals surface. "Everywhere we go we see eight to 10 feet of water," said Kapadia, who traveled through inundated villages between Shikarpur and Sukkur. "All we see are the tops of houses." In Sukkur, where refugees are arriving en masse, the riders have distributed at least 400 hampers of food. Each hamper contains 5 kilograms of flour, 5 kilograms of rice, a liter of oil, salt, tea and water. But the work hasn't been easy. The stench of filth permeates the air. Skin blisters surface from temperatures reaching 48 degrees Celsius (118 degrees Fahrenheit). Kapadia said he can't shake the image in his mind of young children chasing him as he tossed water from a moving truck. The truck was moving at least 30 kilometers per hour, but he couldn't slow down. Mobs of hundreds have pounced on aid workers delivering food or water. "It somehow gives the impression that these are greedy people," Alvi said. "But it's not greed. It's desperation." Hundreds of thousands of Pakistanis have acquired transmittable ailments such as acute watery diarrhea, scabies and respiratory infections. "This is the desperation phase right now," Alvi said. "I think a few weeks ... that's when the diseases will get worse." Prime Minister Yousaf Raza Gilani has called a Tuesday meeting of local and national health officials as well as United Nations agencies and other international groups to address the mounting health crisis. The UN says it still needs about $200 million for aid. Kapadia said he wonders why some aren't donating as much to Pakistani flood relief as they have to previous natural disasters, such as the Haiti earthquake in January. "Maybe it's donor fatigue," he said. "But that's no excuse." Despite the heat, filth, disease and destruction, Alvi said he had no regrets about his decision to help. "We could have stayed home and watched this happen on TV," he said. "But someone has to take the next step."